Dalat is a mid-sized city that looks like a cross between Vietnam and the French Alps. Outside of the city center, it is surrounded by a series of pine-covered hills, lakes, and higher peaks, making for some lovely scenery quite different from the rest of Vietnam. Temperatures are pleasantly warm by day and quite cool at night, down to perhaps 10 degrees Celsius. Be aware that during summer months, rain comes at least once a day and can sometimes dictate the mood and activities you are planning. Coming to Dalat in early days of spring is the perfect time for many activities such as hiking, touring around Xuan Huong Lake. But it is also the time for meditation and contemplation. Coming to Dalat, remember to visit the pagodas here, where you can pray for peace and wealth and the same time admire the beautiful view of the valley below. Linh An Pagoda is one of the most beautiful pagoda in the suburb of Da Lat, away from the city center, so this place always an ideal destination for many tourists. Especially for the friends from the West, who always want to explore the mysterious Orient. In order to reach Linh An, visitors must go through many ramps on a winding hill with evergreen on the other side of the road. Then through the villages of the Nung, then through the tea garden, the vast green coffee garden. The pagoda nests itself between the peaceful mountains, where in front of the pagoda is the Elephants Waterfall, while behind are hills of evergreens. Visiting Linh An in the early days of the year, you’ll find thousands of Buddhists busy coming from everywhere to offer their respect with reverence and the purity of their soul. In addition to worship Buddha, tourists can also admire the majestic Elephant Falls flows day and night, creating a white blur of smoke, making the pagoda even more sacred. 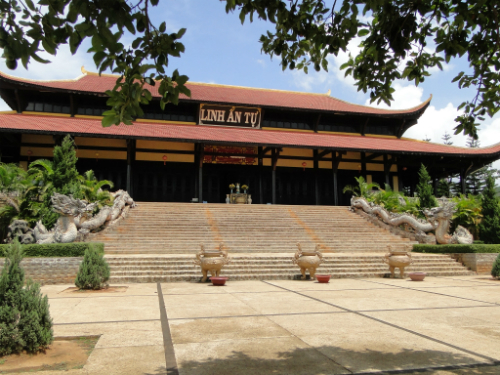 Situated at 120 Tu Duc, about 8 km east of Dalat downtown, is Linh Phuoc Pagoda. Its architecture is unique with the oriental mosaic faience features, helps attract domestic and foreign tourists to visit, worship and contemplate. Stepping into the yard, visitors will encounter the statue of Chenrezik located in the middle of the yard with a gentle, compassionate gesture on her face. The next impression is Long Hoa Park with a 49 m long, 1.3 m wide dragon “guarding” the temple. The dragon skin is made from fragments of 12,000 bottles. The dragon belly is actually a small tunnel. Underneath the dragon is a penjing where fishes swim around, making the pagoda even more poetic. 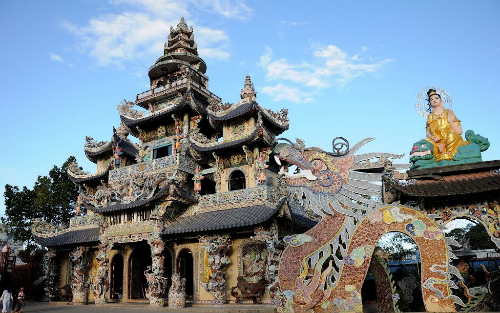 Coming to Linh Phuoc Pagoda, tourists can enjoy the meticulously built architecture such as the 33 m long, 22 m wide Sanctum with the 27 meters high Tien Dan Bao Tower above, carved with beautiful dragons. Inside Sanctum is the 4.9 m high gold-plated statue of Shakyamuni Buddha. Around the statue are the mosaic faience pieces depicting the life of Buddha. 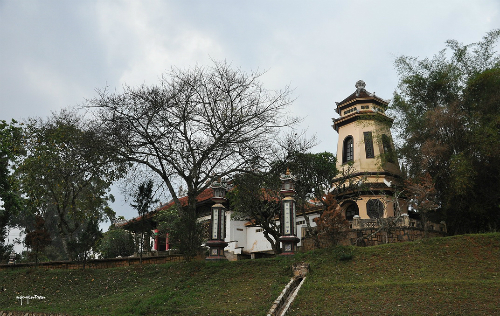 Built in 1938, this is one of the oldest pagodas in Da Lat, Linh Son Pagoda is located at 120 Nguyen Van Troi Street. The pagoda has a modest scale and a simple architectural. However, the historical value of the pagoda is undeniable. Minh Ki, the famous Vietnamese composer before the War, chose Linh Son as the theme for his song “Thương về miền đất lạnh” (Love to the cold land). Many generations come to visit this pagoda because of the relation between the great musician and the pagoda. The pagoda architectural design is influenced heavily on Asian style with simple and harmony lines align with the characteristics of Vietnam pagodas. Located on a low hillside in the heart of the city, Linh Son Pagoda has its own separated world, where the only sounds are the pine trees leaves scratch with the wind and bell and gong of the monks echoed in each evening. As you walk on the ramp through the entrance, you will step into a different realm without the sound of the motorcycle below, just the wind, and the animals around. As one of the most popular tourist destination of fog city, along with the Truc Lam Yen Tu Monastery in Quang Ninh and Truc Lam Tay Thien Monastery in Vinh Phuc, Truc Lam – Da Lat is one of three largest monasteries in the country in the Truc Lam clan. Only 5 km away from city center, the Truc Lam Monastery in Dalat located on Mount Phoenix, between pine green, beside the lake. With a beautiful location, this is not only a place to worship but also the sights of many domestic and foreign tourists. Coming to Truc Lam, visitors can immerse selves into the pure space in the Zen, shake off the busy life, the noise of the clamorous city and rediscover the place in Dharma words and compassion. 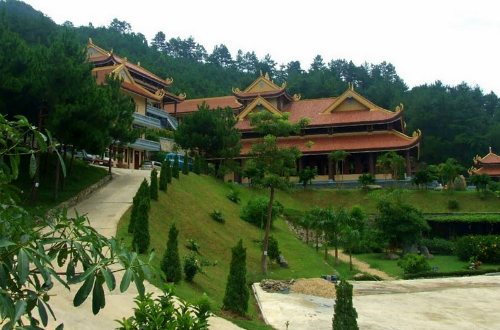 Located on a small hill on Phu Dong Thien Vuong Street, Dalat city, the monastery this is one of the largest monastery in Lam Dong province. Over the past 60 years, the monastery is frequently visit by many tourists and Buddhists who come to worship and admire. A special feature of the monastery is the 24 meters high, 20 meters wide statue of Sakyamuni Buddha whose right hand is holding a lotus petal. 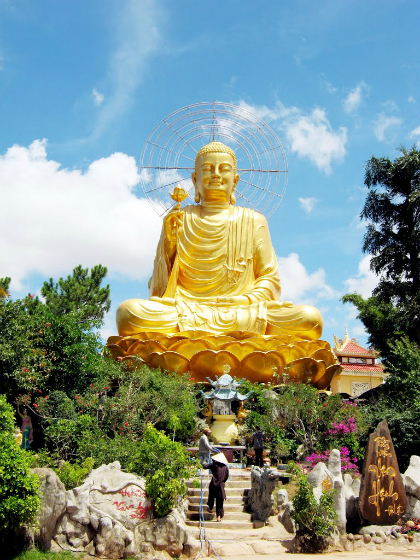 The statue is considered one of the largest Buddha statues in Vietnam. Van Hanh is not only a sanctuary for monks, Buddhist who come to worship but also the monastery that has so many culture architectures that emphasize the Buddhism unique style.